The Bootmobile Rolls into Chicago...not so fast. Chicago, Friday, January 20, 2012. Move that "Weinermobile"--make way for the "L.L.Bean Bootmobile"-- hitting the road and heading west to the Windy City-- maybe, probably, most likely. The larger-than-life embodiment of L.L.Bean's most iconic product, its "Maine Hunting Shoe" has been recreated into a giant 13-foot high and 20-foot long vehicle in honor of L.L.Bean's 100th Anniversary celebration. The Bootmobile made its first public appearance last Wednesday in New York City's Times Square. From there it embarks on a tour of major cities in the U.S. Earlier reports had the "Boot" stepping into the Second City to re-boot at the Chicago Auto Show,(opening February, 10). 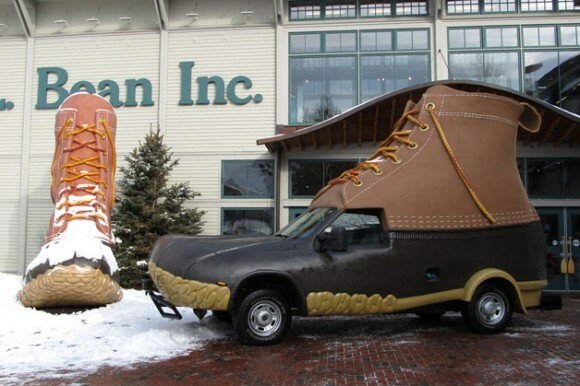 WRONG, according to the spokesperson at L.L.Bean, "We can confirm that the Bootmobile will NOT be at the Chicago Auto Show--we will let you know if/when it will make its appearance in Chicago." Stay tuned, SMC, will keep on top of this breaking story. The question is: If, What and When, the "Boot" steps into Chicago--How will it do in the Chicago snow? Some fun facts about the Bootmobile. If the Bootmobile was an actual boot, it would be size 747--like the airplane. The Bootmobile is 13' tall, 20' 6" long and 7' 6" wide. The Bootmobile is green--it generates 0% CO2 emissions thanks to a diesel engine with urea tank and particulate filter. If an actual person were to wear the Bootmobile, the person would be 143' tall - 32' taller than the Statue of Liberty. The Bootmobile laces are made of 12 strand braided mooring rope, capable of towing 106,000 lbs. The driver enters and exits through the heel. A camera provides visibility for the rear and top of the Bootmobile. The Making of the Bootmobile. To see a video of the making of the Bootmobile go to youtube and search for the L.L.Bean Bootmobile video.